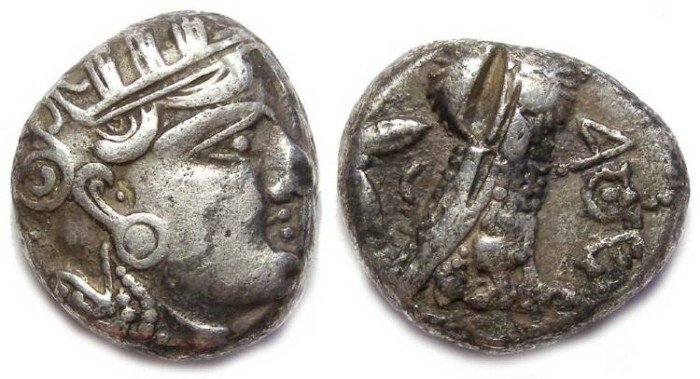 Eastern Imitation of an Athens style tetradrachm. 4th century BC. Date : This type imitates the Athens tetradrachms struck in the 4th century BC, but the style is off and the shape of the Q is very odd. It is probably struck somewhere farther East and/or South, but has not be identified as to the exact series it belongs to (that often cannot be defined at this time). Size : 19.7 x 22.4 mm. Weight : 16.67 grams. Reference : Imitating the type of Sear-2537. Grade : VF for the type, but test cut. Reverse : Owl standing right, with an olive sprig and crescent moon over its shoulder, with AQE to the right. TEST CUT ON THE OWL'S FACE.